Partially demolished church at 4233 Chestnut St. property recently acquired by Alterra Property Group. Alterra Property Group has acquired what’s now the site of a half-demolished Gothic-style church in University City as part of a new westward push for the developer of apartment projects such as Lincoln Square in South Philadelphia and the Icon tower in Center City. Center City-based Alterra paid $17 million for the nearly one-acre property along the eastern side of 43rd Street, between Chestnut and Ludlow Streets, where the 19th-century Christ Memorial Reformed Episcopal Church is being dismantled, according to records filed with the city. The purchase follows Alterra’s $9.9 million acquisition last year of a 16,300-square-foot former auto-maintenance-garage property about a block to the east, at 4125 Chestnut St., where a 130-unit apartment building is nearing completion, records show. Alterra’s activity in the area comes amid a flurry of construction in a section of West Philadelphia that had until recently been off the beaten path for many University City developers. Other recent work in the area includes Campus Apartments’ newly built student-housing project at 41st and Sansom Streets and plans by U3 Ventures and Stockton Real Estate Advisors to redevelop a pair of buildings at 40th and Chestnut Streets into a mix of residential units, visitor accommodations, and restaurants. “We believe in the extension of ‘U City’ westward and want to be a part of delivering sensibly priced, modern housing, primarily to graduate students, retained graduates, and young professionals,” Alterra managing partner Leo Addimando said in an email Tuesday. Alterra Property Group is building a six-story apartment, seen here at left, using modular construction methods at 4125 Chestnut St., where an auto-service garage once stood. Alterra acquired 4125 Chestnut St. after archaeologists surveyed a 19th-century African American burial ground that had been discovered at the site as it was being cleared for development. The six-story apartment project there, to be called "LVL 4125,″ is scheduled for completion by June, Addimando said. It will be the state’s tallest building to be completed using wood-framed “modules” that are manufactured off-site, which makes construction faster and less costly, he said. Plans for the Christ Memorial Church site call for something similar to the LVL 4125 project, but with more units and likely some commercial space, Addimando said. Before Alterra bought that property, it had been advertised for sale by brokerage Rittenhouse Realty Advisors as being able to accommodate a pair of two-story apartment buildings with 323 units between them. 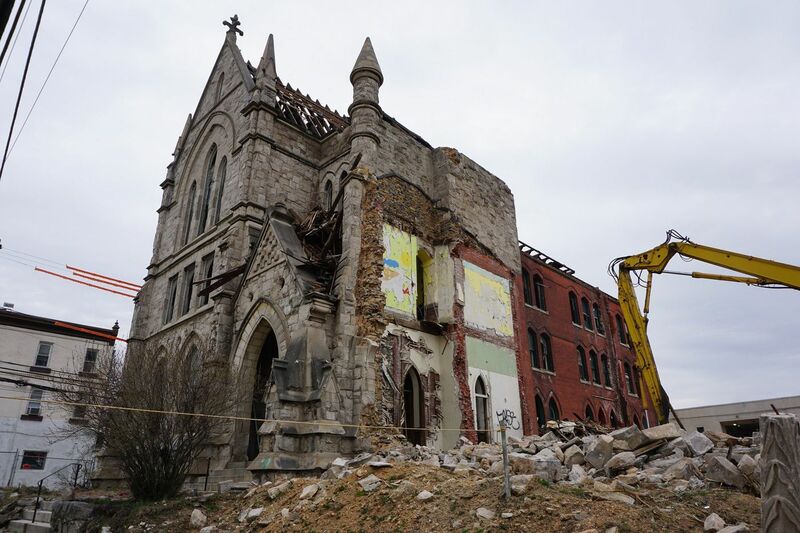 The demolition of the Gothic-style church at the 4233 Chestnut St. site frustrated preservationists, including a team that had been working to have the building protected as a historic asset when a former owner, developer Guy Laren of West Philadelphia’s Constellar Corp., secured a permit to raze the structure. A Laren affiliate sold the property in June 2018 for $10.5 million to a group involving Philadelphia- and New York-based real estate investor Christopher Rahn, according to records filed with the city. Rahn’s group sold the parcel to Alterra in February. Alterra also had acquired the former garage site at 4125 Chestnut St. from a Rahn affiliate after Rahn’s group bought the property for $5.4 million in July 2017 and secured permits to build apartments there. The project is being completed by Union County-based construction group Johns Buckley LLC, which specializes in modular buildings. More deals in the area involving Rahn appear to be on the way: A corporate entity that shares an address with his past businesses is named on a demolition notice posted on two rowhouses at 4240-56 Chestnut St., where the Intercultural Family Services Inc. human services agency operates a health center, likely indicating he has a contract to buy that property. Meanwhile, another business entity registered to a Rahn address is named after the location of the Intercultural Family Services’ headquarters — 4225 Chestnut St. — across the street from the health center and beside the church site, suggesting he may have an interest in that property, as well. A message left with Intercultural Family Services was not immediately returned. Rahn declined to discuss the properties. Other real estate bought and sold by Rahn affiliates in recent years include sections of the old Northeastern Hospital in Port Richmond, which have since been acquired by a group involving Daniel Govberg, scion of the 103-year-old family-run Govberg Jewelers watch business. Govberg’s group, BG Capital, plans to redevelop the land into a medical-office complex that it’s calling the Commonwealth Campus, according to a website for the project.